Christophe Perny and his team invite you to a true culinary experience in line with the location’s global health vocation. Enjoy healthy, varied menus created with a contemporary and original, approach based on conscious eating principles. 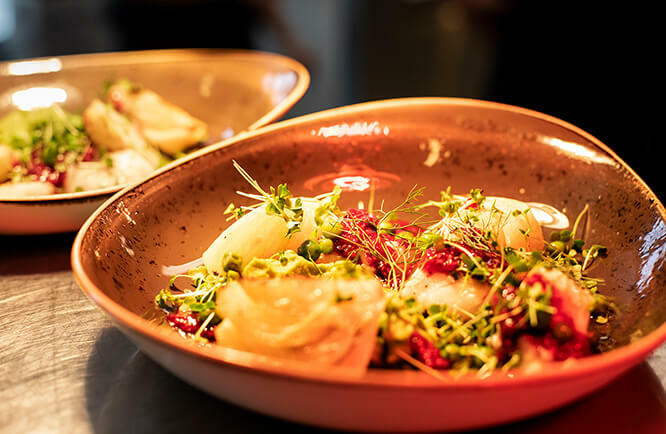 Anchored in the history of Le Monastère and its founding sisters, Le Restaurant offers healthy, northern-inspired cuisine which combines the well-known virtues of local and organic foods. At lunch time, Le Restaurant du Monastère offers a table d’hôte format. First, help yourself to our delicious soup of the day, as well as a variety of healthy salads. Then, choose from one of three daily dishes offered (fish, meat, or vegetarian/vegan). For dessert, we will serve you a small dessert verrine, as well as a cup of signature Le Monastère des Augustines herbal tea. Jean-Mathieu Leclerc, our lunch chef, loves to pamper our guests by creating menus featuring an array of options to suit every taste and need. Sustainable development being one of our main priorities, we favour local and organic foods, keeping seasonality and harvests in mind. Our dishes reflect seasonal ingredients, and—of course—our team’s inspiration. On top of following our global health vocation and striving to use resources responsibly—which has always been part of the Augustinian sisters’ lifestyle—our evening plan is also influenced by our chef Sylvestre Hervieux-Pinette’s native roots. His is a contemporary, and inventive cuisine inspired by our northern tradition. Lichen, elderberry, seafood, game meats, green alder, birch syrup, sea pea, daisies—a true culinary adventure awaits! 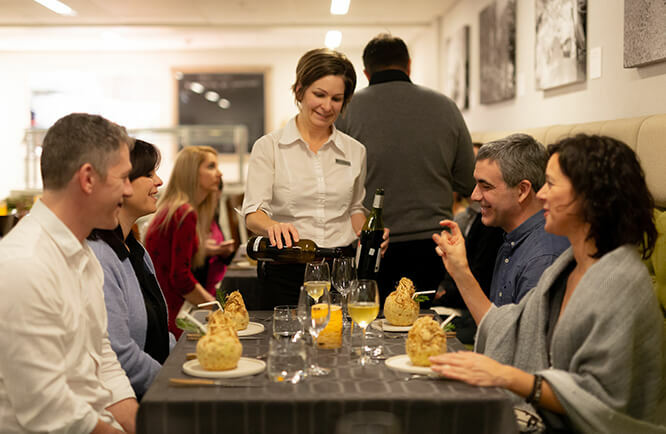 Served as tasting plates and including six courses, the Experience plan allows guests to sample several dishes throughout the evening and discover new flavours that are each more surprising than the last. Our Experience plan is available from Tuesday to Saturday inclusively. On Sundays and Mondays, the evening meal consists of a healthy buffet made up of salads, vegetarian dishes, fish, and meat. Our restaurant is open to the general public as well as to guests staying at the Monastère. Please note that reservations placed before 5 p.m. are mandatory for the dinner meal. Parking is free for the guests of Le Restaurant for a period of two hours. Service charge included, taxes not included. We offer personalized consultation in healthy eating to help guide your choices during your stay… and beyond. This is one of our specialized services, also available with some packages. Here is a list of our restaurant principles, implemented to guarantee a healthy cuisine. Our high quality foods are prepared to optimize nutrient preservation because at Le Monastère, your health is our priority. Le Monastère’s boutique offers a selection of products to enhance your stay or prolong the experience after your return home. You will find articles touching on the exhibits in the museum, nutrition, spirituality and holistic health, along with items based on local history and traditions. Situated near the main entrance, the boutique is open to the public. Its lunch counter also offers a range of fresh and healthy alternatives. You will find a delicious assortment of sandwiches, salads, beverages and snacks.